A costly mistake by Laiser Hill goalkeeper saw them lose 0-1 to Passenga. Soweto Girls turned tables on national champions AIC Kosirai in volleyball girls pool A in a thrilling five setter at Eldoret Polytechnic ground in the ongoing Federation of East Africa Secondary Schools Sports Association in Eldoret. In football, Laiser Hill, the national champions were upset by former champions Passenga at Hill school. Adida Oduor scored the lone goal for former national Passenga champions national Laiser Hill in an entertaining football match played at Hill school. Oduor netted a dead ball in the fourth minute after a mistake by Laiser Hill's keeper Frankline Otieno who came off his line to outside the 18 feet box to arrange his defense wall. But he only returned to his lines to pick the ball from the back of the net. The national champione were dealt another blow in the 11th minute when keeper Otieno was stretched off injured. He was replaced by Eric Muhanda. Laiser Hill appeared to have settled early and dictated the pace but failed to score. The game was stopped for seven minutes when a Laiser Hill fan marched into the field protesting an offside against his side. Francis Odemba of Passenga thwarted Laiser Hill’s efforts with Kennedy Mwangi and Jeffrey Owiti missing several shots on target. At half time, Passenga led 1-0 at half time. The second half produced no goal. According to Passenga coach Stephen Gikonya, all they needed was a score and then deny their opponents scoring chances. “I know this team because we have been meeting for several times and we won or lost against them. I told the boys to search for a score and defend the game since we are eying is to come out of the preliminaries,”Gikonya said. Laiser Hill’s Anthony Kirimi blamed his side for playing a defensive game instead of creating scoring opportunities. “The game was well planned but after the score, the boys decided to play a defensive game. All's not lost. We are back to a drawing board and are optimistic,” Kirimi stated. Regional defending champions Masaka of Uganda lost 1-2 to Alliance of Tanzania in their Pool B opening match. Masaka tactician Simeon Mugerwa said it is usually a tense match. They drew 2-2 last year in the finall but Masaka won through penalties. Earlier in Pool A opening match, Barding stamped their authority against Hanika TSS of Rwanda beating them 2-0. The volleyball tie was an all Kenyan affair although Kosirai, from nearby Nandi County enjoyed the support of local fans which did not deter the Metropolitan school from dominating to the match. Soweto won the first set 27-25 before Kosirai, who has tall players took the second 25-22 before Soweto won the third 25-20. The match was level 2-2 after Kosirai took the fourth set 25-21 before the decisive fifth set which Soweto won 16-14 to lead Pool A after winning two of their opening matches. Winning coach Johnston Makabwa said it was a great day to win against the champions. “Both teams were strong but through our determination, we won. Our target is to play in the final. We don't want to underrate any team hoping to meet Kosirai again at the final,” said Makabwa. St. Aloys from Rwanda easily beat their Ugandan opponents 3-0 (25-9, 25-23, 25-17) in 53 minutes. Sengera Boys from Kenya barely broke a sweat against Ugandan side Buremba in boys' Pool B volleyball match. Sengera won 3-0 (25-18, 25-15, 25-12). On court two, St. Mary’s Kitende from Uganda lost 3-0 (25-20, 25-22 and 25-20) to Apapen of Rwanda. National hockey champions Friends School Kamusinga easily defeated debutants Upper Hill 3-1 played at the same venue while reigning regional champions Sinyolo Girls had a sweet revenge against Kerugoya Girls in girls’ category. 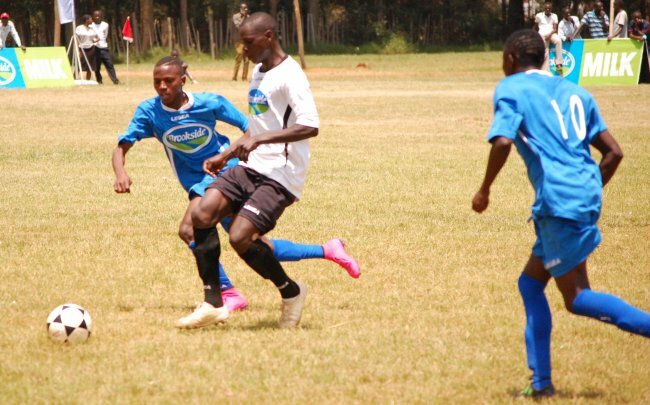 Kerugoya defeated Sinyolo in last year’s games in Rwanda.